Control the speed of a DC motor without sacrificing torque. This Pulse-Width-Modulation (PWM) DC motor speed controller can provide up to a maximum continuous current of 30A to your DC motor or other DC load thanks to a digital microcontroller based (PIC) design and two highly efficient High-Power MOSFETs for cooler operation. The controller has two modes of operation: Fixed or Variable frequency. The fixed frequency mode of operation runs the controller at 100 Hz. In the variable frequency mode of operation, the frequency is adjustable from 244 Hz to 3.125 KHz. Duty cycle is fully adjustable from 0% to 100% in both modes. The controller also offers built-in soft-start feature that greatly reduces the mechanical stress on the motor as well as the electrodynamic stress on the attached cables and battery therefore extending the life span of the whole system. When power is connected to the circuit, the duty cycle will start from 0% and go up to the preset value in about 1 to 1.5 seconds. 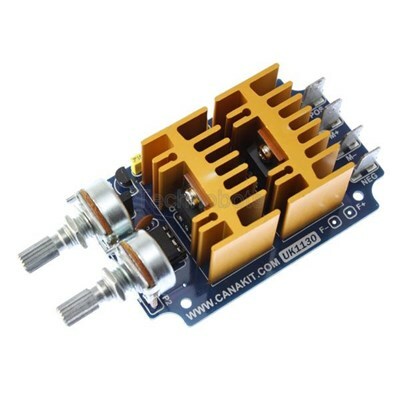 An optional fan is available separately (CanaKit part # FAN-12V) and recommended for continuous operation at maximum power or for high frequency at high current applications.